Our OEM Process for medical products ensures that your overall goals are met by following the systematic process below. We begin with a needs assessment, then take our customers through the steps of design to prepare a device ready to testing. 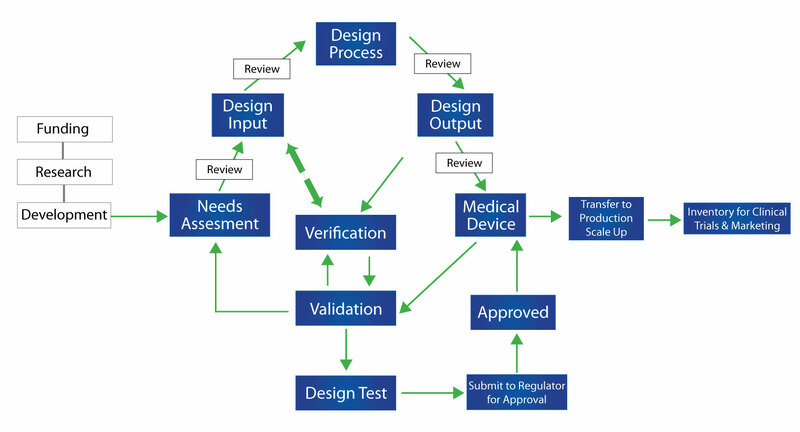 Validation, verification, design test and preparation for 3rd party approval steps ensure that the device being developed meets all the needs. Review sessions are conducted at every step in the process to communicate and address progress. Our extremely flexible and adaptable solutions are the perfect answer for all of your OEM/OED laser needs. Resources for OEM development include a team of over 30 engineers, all with advanced degrees in multiple disciplines. Leading these teams are senior engineers with many years of industrial experience and a strong focus on vertical integration. Our ISO 9001 & 13485 modern manufacturing facilities house a complete team with all the tools they need for procurement, production and quality functions. The ISO 13485 certificate has been maintained for over 15 years and has been scrutinized routinely via annual device inspections performed by 3rd party auditors of our customers. B&W Tek has produced tens of thousands of privately labeled medical lasers, enabling our OEM laser customers to do what they do best without having to worry about production and engineering. Our extensive experience has served many customers worldwide, making B&W Tek the ideal partner for your OEM laser needs. Talk to an expert today to see how we can fulfill your OEM laser needs. Fill out the form here to request more information.